So this janky deck is supposed to be janky, it's inspired by League of Legends where the champion Shaco is a pretty horrible support. The point here is a standard wizard engine of Archaeomancer and Ghostly Flicker (or any combination thereof) and trigger a bunch of stuff. I wanted to keep the counters/murders to a limit and really stick with swerve cards, and such. The big thing is the death from nowhere cards like Backdraft. I would be more than happy to hear the opinions of other people on what they think would make this better. Making hasty copies of Apprentice Necromancer seems pretty fun. Disciple of Bolas seems ok too; the original and the token can sac each other, so you get 4 cards and 4 life for five mana. If you're playing with a ton of blinky cards, you can also run some shenanigans with Isareth (flickering the critter with the counter on it lets you keep it). If you really want to be on theme here, you probably would want Teferi's Puzzle Box, Exhaustion, Ignite Memories, Escape Artist, Smoke, and about 20x more Clones and Rakdos themed cards. 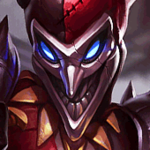 That's kinda how I came to the idea of the deck, I could just make up a bunch of Shaco clone tokens (via. the ability) and run it from there. While not explicitly stated I wanted to keep it to Instants and Wizards... for no real reason whatsoever. I do think that trimming the CMC down would be better (cheaper for the engine). I think there are enough instants for Bolas's 2 CMC dude, that necromancer looks good. I think the Sage of Ephytwhatever is also a good CMC 1 guy. I gotta playtest it more, haven't played it once yet to find out.